Coming off the plane I noticed a group of three silent figures and by their deathly pale faces I recognized them: his mother, father, and pregnant wife. They stood together, strangely separated from the hustle bustle of the airport, waiting for me. They watched in solemn silence as I wheeled the casket toward them. It was a tense moment. No questions were asked, no tears shed. The mother, still reeling from the shock of losing her son, did not cry. Instead she bit her lips, hard. The father wrapped his arm around her for support, but he was the one that seemed closest to the verge of collapse. Then he steadied himself, somehow, and with a gentle motion, stroked the flag that wrapped the coffin. “So sorry for your loss,” I said, feeling awkward for using a phrase that was too weak and all too common to convey what I was feeling. He nodded his head to signal that he heard me, but neither he nor the mother could utter a single word. In their place, the soldier’s young wife came to me, holding something in her hand. Meanwhile, from out of nowhere, a lone bagpiper came by. In the midst of a busy airport he looked like an apparition from a different place and time, marching slowly towards us. As he strolled past the flag-draped casket I caught the music he was playing: it was an old song, written by an Englishman who in the early part of his life had been an outspoken atheist, libertine, and slave trader, only to find his faith after riding out a storm at sea. The sound of it was magical. It quelled the noise of people fussing, people walking all about, rushing to and fro with suitcases and stuff. At the same time it calmed the silence, the angry silence in my heart, opening it anew to sadness and to joy. It was then that the soldier’s wife took a step forward to the casket and placed the emblem on it, which for her meant the beginning of farewell, and for the fallen, the end of a long journey, the journey home. Her voice was so soft, so heartbreakingly delicate, and yet it made the hair rise on my head and the flesh quiver on my bones. I felt—oh, I can’t explain what I felt! It was not only grief for this man, who was a brother of mine even though I had never come to know him, but also pity for his family and for all us, civilians and soldiers, the fallen, the wounded, the loved ones back home, all the lives forever changed by this horrific war. In my childhood, my mother used to sing Amazing Grace to me in place of a lullaby, because it had always calmed me down before she tucked me in, before she said good night. The music made me think of Natasha. In a complete reversal of emotion I found myself overcoming my rage, my sense of betrayal. Suddenly I realized that whatever had caused the break between us should be set aside. It was time to accept and be accepted in return. I, too, was coming home. And I could not wait to see my father. 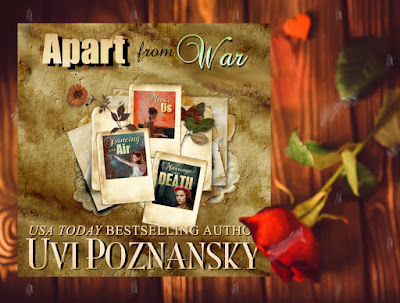 I'm so excited to present my new bundle, Apart from War. 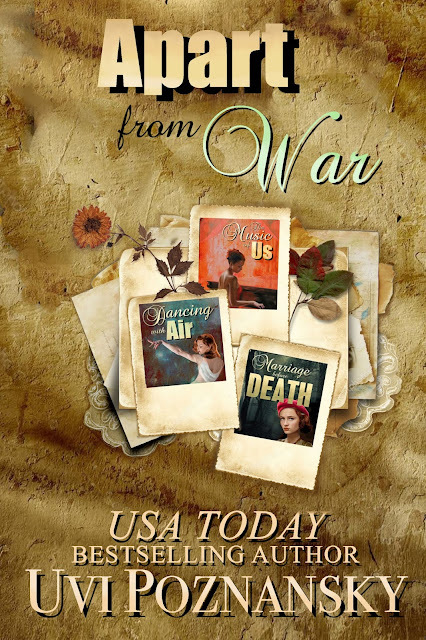 It includes three novels, where one begins where the previous one ends, so you keep yourself immersed in the times and in the saga that begins when Lenny and Natasha first meet, following them from the US to England to France during WWII.